The building is said to “holding up well” despite the huge blaze. Firefighters at the cathedral early this morning. 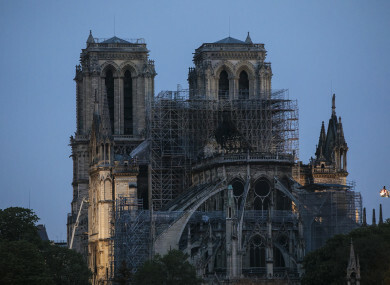 FRENCH INVESTIGATORS HAVE interviewed construction workers involved in renovation work at the Notre-Dame cathedral, as they sought to identify the source of a devastating blaze at the monument that has sent shockwaves through France and the world. The fire began at about 7pm last night and around 500 firefighters battled the blaze throughout the night before it was declared fully extinguished at about 10am this morning. Junior interior minister Laurent Nunez told reporters this afternoon that “some weaknesses” have been identified in the structure of the fire-ravaged cathedral but overall the monument “is holding up ok”. “Some weaknesses have been identified particularly in the vault and the gable of the northern transept, which have to be secured,” Nunez said, adding that five neighbouring buildings had been evacuated. Culture minister Franck Riester said that three large holes have been identified in the building. “There are three large holes, one which is in fact due to the crumbling of the spire and another one at the cross-section of the transept and then the ceiling and the northern transept,” he said. Investigators interviewed witnesses overnight and began speaking to the employees of five different construction companies which were working on the monument, said public prosecutor Remy Heitz. “Nothing indicates this was a voluntary act,” Heitz told reporters, adding that 50 investigators had been assigned to the case. French President Emmanuel Macron vowed to rebuild the cathedral described as the soul of the nation and expressed relief that “the worst had been avoided” in a blaze that had at one point threatened the entire edifice. Around 500 firefighters battled into the night to control the flames, declaring in the early hours of today that it was partially extinguished but completely under control, around nine hours after it broke out. “They are tired but fought the fire with a lot of courage and determination from outside and inside, and I’d like to underline this, with the peril of their lives and that’s what enabled us to save the building, “Nunez said. Paris fire brigade chief Jean-Claude Gallet confirmed “the main structure of Notre Dame has been saved and preserved”, as well as the two bell towers. But “the whole of the roof has been devastated… a part of the vault has collapsed, the spire is no more”, fire brigade spokesman Lieutenant-Colonel Gabriel Plus said. “Notre Dame survived all the wars, all the bombardments. We never thought it could burn. I feel incredibly sad and empty,” Stephane Seigneurie, a consultant who joined other shocked onlookers in a solemn rendition of Ave Maria as they watched the fire from a nearby bridge. Some of the artworks are to be moved to the nearby Louvre museum and more paintings may be moved later in the week when the are assessed for damage. Macron cancelled a planned national policy speech on recent “Yellow Vest” protests and instead headed to the scene, where he vowed the cathedral would be reborn. “We will rebuild Notre Dame because it is what the French expect,” he said, describing Notre Dame as “the epicentre of our life” and the cathedral of “all the French”, whether religious or not. EU Council President Donald Tusk called on all member states to take part in the rebuilding effort. German Chancellor Angela Merkel called Notre Dame cathedral a “symbol of European culture” as the blaze raged. The Vatican expressed its “incredulity” and “sadness” over the fire and Macron will speak to Pope Francis about the fire later today. Britain’s Queen Elizabeth II said she was “deeply saddened” by the devastating fire. “Prince Philip and I have been deeply saddened to see the images of the fire which has engulfed Notre-Dame Cathedral,” the monarch said. It would go on to feature as a central character in a Victor Hugo novel published in 1831, The Hunchback of Notre Dame and shortly afterwards a restoration project lasting two decades got under way, led by architect Eugene Viollet-le-Duc. The building survived the devastation of two global conflicts in the 20th century and famously rang its bells on 24 August, 1944, the day of the Liberation of Paris from German occupation at the end of the World War II. Email “Notre Dame fire: Investigations focus on construction work as world reacts to devastation ”. Feedback on “Notre Dame fire: Investigations focus on construction work as world reacts to devastation ”.